Digital printing is not a method of printing in the traditional sense, as with offset-, flat-, intaglio- or surface printing. In digital printing the picture to be printed is sent directly from a computer to the printer without a printing frame having to be used. Besides the laser printer the digital inkjet printer permits each part to be printed separately and differently(non-impact-printing) without the changing of the print matrix. The ink jet printer functions without contacting the surface and with a high degree of accuracy. By the use of different inks the process is suitable to an exceptionally broad range of applications. Synthetics as well as metals can be printed. It is also possible to dye print anodised aluminium. 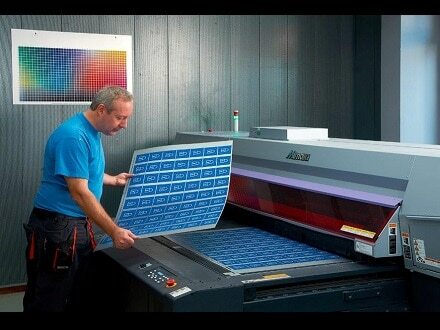 In combination with screen printing or offset printing special possibilities arise for digital printing e.g. changing texts, numbering or using various typographies within a series.